Here is the question (as I like to start with a question that I seem to already know and then reveal by the end of the article)…where in time should the ancient ruins actually exist? That appears as a weird question because ‘ancient ruins’ are ancient; certainly existed in distant past and endured over many millenniums. There is only one problem; that answer does not fit our Darwinian education and historical viewpoint by the highest of learning institutions. THEY, out of total ignorance or by purposeful disinformation, have conditioned the masses to believe WE ARE SUPERIOR TODAY compared to our ‘primitive’ ancestors. We are taught ‘slaves’ built the ancient, massive building-blocks of granite/sandstone/limestone which form the pyramids and various structures of awesome stonework. We have been brainwashed to believe the pyramids were mere ‘tombs’ constructed by slaves when nothing could be farther from the truth. A ‘cave-man’ agenda has been shoved down our throat whether we like it or not. From stereotypical films, television commercials and books or misguided anthropology courses…it is PUSHED into our psyche…we came from primates; from ape-like Cro-Magnons who just learned about ‘fire’ and the simplest of tools. Follow the logic or common sense. How could cut, prehistoric, stone blocks in the THOUSANDS OF TONS be carved with such precision; transported far distances to impossible (remote) locations; intricately placed together with unbelievable precision…if our early ancestors were only primitive cave-people? 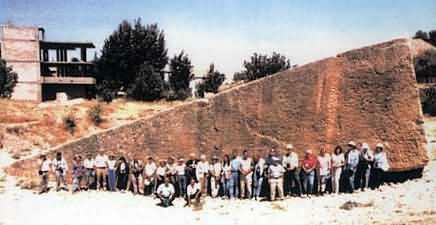 The pyramids are of an extreme age. The answer is not ALIENS (the answer is HUMAN Atlanteans). Sitchinists and Von Danikenists should discard alien-conditioning when our ancestors were really GREATER FORMS OF HUMAN! (Read on-line, ‘Von Daniken’s Mistake’). Traditionalists not only discredit the idea that super-knowledge and techniques existed in our long/human history, they train us to think SIMPLE MEANS like ropes; ramps; pulleys and many slaves constructed ‘temples’ like Stonehenge or the ‘pagan’ statues at Easter Island. Common sense in physics comes in when we ask, ‘hey, wait a minute…why don’t a few thousand, able-bodied, college students mass together and build another Stonehenge? Surely, it could be achieved with enough people? Right?’ The answer is NO; not even close. The attempt would be a miserable failure. Hypothetically…let us say that we could coax the richest industrialists of major corporations, world leaders, owners of ball teams (Trump-like people) etc…to again try to build Stonehenge or a small, stone pyramid with the GREATEST MACHINES AND STATE-OF-THE-ART TECH THAT MONEY COULD BUY! After trillions of dollars were spent, the result will be the same; the attempt would be a miserable failure. (We cannot effectively move even a 5-ton block). Why aren’t Great Pyramids, stonehenges; structures on the order of Easter Island statues, Pumapunku, Yonaguni, Valley of the Kings, Teotihuacan, Tiahuanaco going up all the time? I mean, they were made by primitives with simple techniques…right? The truth is stonework from the Old World such as what adorns tops of Andes Mountains…is IMPOSSIBLE. Yet, there it stands. What cannot be duplicated today exists in utter ruin. This is the future in the past. The reason for our failures is we do not (publicly, for all) use anti-gravity and powerful lasers that can cut a mountain in half. But, our HUMAN ancestors once did. So many stone structures in locations like India, Zimbabwe, Egypt, Maya and Incaland as well as Europe with prehistoric ‘dolmens’ cannot be replicated today even if we employed the best of conventional technologies. Consider that in the Andes, among the ‘impossible’ ruins and along with other sites of ancient mysteries, Cro-Magnon skulls were found LARGER in brain-size than modern-day human beings! These were not the caved-in, ‘sloped’ foreheads of primates or dumb cave-people that we are led to believe. Real skulls of the Cro-Magnons are not primitive in any way. Where or WHEN should the brain-size of this group of our ancestors exist? The incredible answer is…the FUTURE. This comes as a blow to our modern ego. We are not superior today. We have devolved MENTALLY, technologically and probably physically/spiritually also. This is what occurs over much TIME when technology blows up in our face or used incorrectly (destruction of World Power Grid plus early, atomic warfare). Keep in mind round calendars of the ancients; their math; their astronomy; building techniques and science in general were all superior to the 21st Century. Why should we believe our ancestors were originally barbaric? It makes more sense that we have FALLEN from the privilege of utopia/Eden and the peace that technology could bring. Knowledge used for war or destruction becomes the Forbidden Fruit. Possibly, we will not have technology used the right way for a very long time. We should take comfort that Utopia/Atlantis once happened here on Earth…or, the fact that we bi-peds have the ‘potential of gods’ and can shed the misconception of a primitive genesis on Earth. PEOPLE flew in legendary ‘sky-chariots.’ Maybe the angels will return…and they will be us. The above article will begin a series of articles; oddities from the past or mysterious examples of the Future in the Past.